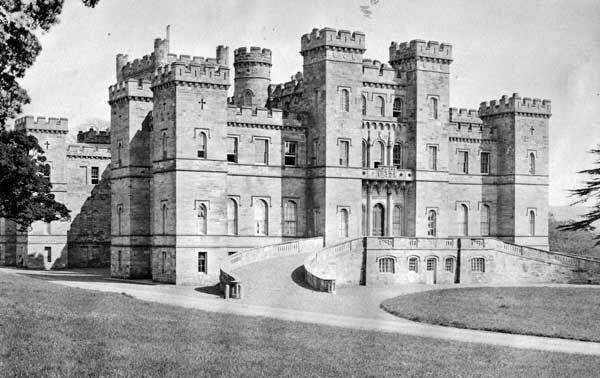 Clan Crawford, their Castle and information. Clan Name: Crawford - various spellings Craufurd. Clan Lands: Lanarkshire, Renfrewshire, Ayrshire. 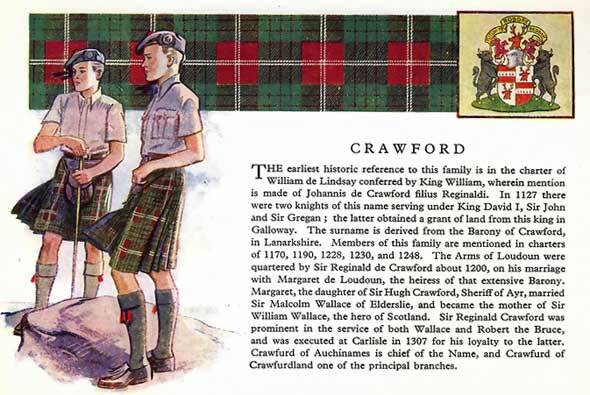 Clan Crawford as a whole are considered to be armigerous and this is due to the fact that it has no current Chief. The last recognised chief was Hugh Ronald George Crawford in 1904, and it was he who packed up his belongings, sold the entire estate and immigrated to Canada in this same year. In 1942 he died, leaving no heirs for Clan Crawford. Sir Hugh Crawford 1195 - 1265, third Sheriff of Ayrshire and Chief of Clan Crawford had a daughter called Margaret. She married a Sir Malcolm Wallace of Elderslie and their offspring named William, born in 1270, was destined to become a legend in the fight to preserve Scottish independence. Sir Reginald Crawford, became the fourth sheriff of Ayr and the next Clan Chief. Being the uncle of the outspoken William was not without peril and was to cost him his life at a later date. Sir Malcolm Wallace was also brutally murdered by the English. as the administrative centre for the Barony of Crawford and it is from here that the surname and the Clan were descended from. The castle itself cannot be dated any further back than 1175 but it was believed to have existed for a long time before this, although it cannot be proved or disproved as there are no written records. 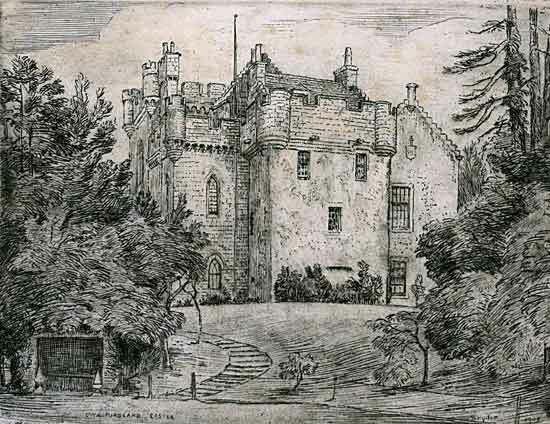 Crawford Castle was divided between four generations of the clan with the same name and this was mainly due to marriage, birth and other such occasions. It is also fact that another Scottish Clan, Clan Carmichael were once hereditary constables of the castle. 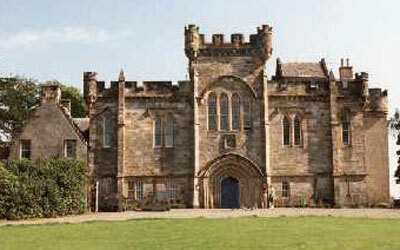 During the wars of Scottish independence the castle was taken over by the English King, Edward I. The Scots were having none of this, however, and William Wallace stormed the castle with 40 men in 1297 and ejected the invaders. His reasons were more personal though and this was down to the fact that his mother was the daughter of one of the Chiefs of Clan Crawford and it was therefore in his interests to keep the castle within the family. Craufurdland Castle, near Kilmarnock, was started by Sir William Crawford, who was knighted by King James 1st for bravery. It was started around 1245 and is still lived in today by descendants. 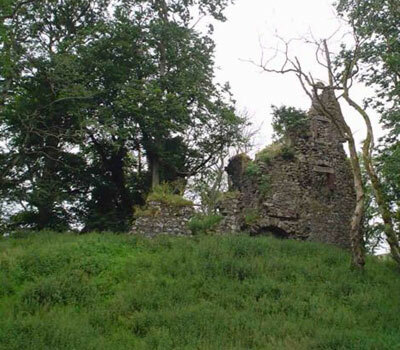 This is only two of the castles linked to this clan, there are more to follow shortly. The Crawfords were important to Scottish history not only because the great William Wallace being born to a member of the clan.